Eggplants are versatile fruits that belong to the nightshade family along with tomatoes and other fruits. Most are heavy, dense fruits on medium to large sized bushes which wouldn’t be appropriate for container grown eggplant. There are cultivars, however, that have been developed to be compact as an answer to the growing number of small space gardeners. These smaller plants provide a means to growing eggplant in containers. Modern breeding programs are answering the call of the limited space gardener. With the rise of upside down gardening, traditional container gardening has expanded its previous barriers. Eggplants in pots are as easy to grow as tomatoes in pots. 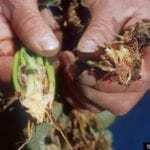 They need large enough containers to support the roots of such a heavy plant, a well draining medium, extra food and consistent water and, of course, the right container. Container grown eggplant require large pots to facilitate their growth and provide room for the small bushes. One of the most important elements of container grown eggplant is the container. Choose a large pot with a 5-gallon capacity. Growing eggplant in containers requires 12 to 14 inches of space per plant or three plants can be placed in a 20-inch container. Unglazed pots dry out more quickly than glazed pots, but they also allow the evaporation of excess moisture. If you remember to water, choose the unglazed pot. If you are a forgetful waterer, choose the glazed pots. Make certain there are large, unblocked drainage holes. Eggplant starts are the best way to go unless you live in a sunny climate as they will give you a jump start on the growing season. The best medium for container grown eggplant is two parts good quality potting soil and one part sand. This ensures adequate nutrients and water retention while encouraging draining of excess moisture. 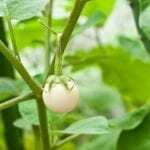 Plant the eggplant at the same level they were in their nursery pots and put a handful of time release fertilizer in the hole at the time of planting. Water the pots well and install a small support system, like a tomato cage.